Building Information Modelling (BIM) is a digital representation of physical and functional characteristics of a facility. It is about information that is built up starting from the phase of design, to construction, and finally operations and maintenance, in both geometry and non-geometrical form describing building elements. It is gaining traction around the world, presenting new ways of building models that were previously not possible. So, how can a BIM model be advantageous to facility managers? It is important to firstly understand that BIM is not a technology. While technology helps in the creation of a BIM model, the software alone does not make up BIM. It is the way in which the model is produced, shared and used throughout the entire project life cycle. And in the case of Facilities Management (FM), it means working on the same vanguard beyond construction phase. Effective FM includes the ability to achieve real-time access to accurate information on building facilities. Knowing instantly about your assets (basic information) and how things can be fixed correctly (maintenance information) are key to providing quick & effective responses to issues & problems. With BIM modelling that integrates real-time data, FM professionals are able to plan smartly for building systems that require preventive maintenance, and understand the real-time health conditions of the operations systems. For this, extending BIM modelling through to meet the needs of FM is essential. Manufacturers are now offering their products in BIM format, so engineers and architects can incorporate specific product data into the model from the onset. One could even create a quick link of the manufacturer’s manual and operating instructions to our BIM FM models. 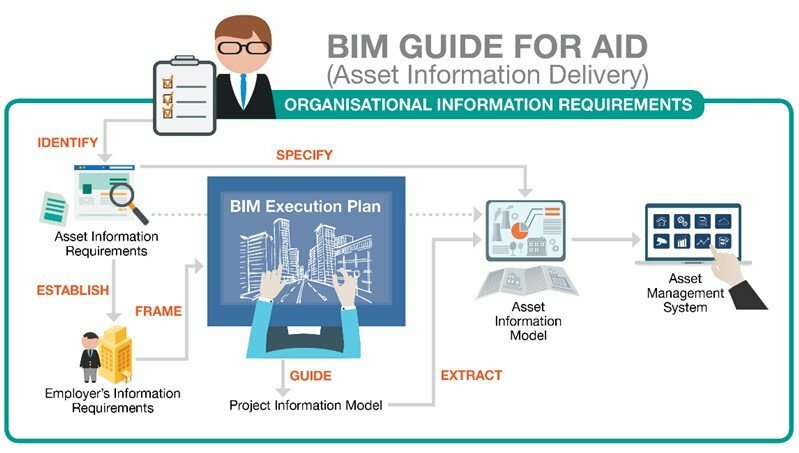 The BIM development process is usually planned and defined in the BIM Execution Plan (BEP), to ensure that all parties involved have access to shared data and platform. Data exchange formats need to be agreed by the entire value chain, collaborating and contributing to the Information Delivery Process. And how this could be specified in the Tender Specifications (Employer Information Requirements, EIR). our BIM FM models. The process also establishes an Asset Data Drop throughout the whole project cycle, adding data in the build-up of the BIM model. It is designed for BIM managers to manage all data drop during the design stage, and further complete it throughout the entire construction stage. The current situation with the design and build sector is that asset information handovers are usually done in the form of 2D drawings or paper documents. Hence, COBie (Construction-Operations Building information exchange) standard is introduced as an open, standardised electronic format to replace the current paper-based documents. In general, the COBie standard was developed for the exchange of information including spaces, equipment and assets. This standard defines expectations for the exchange of information throughout the lifecycle of a facility. The importance of building an Asset Classification Systems in BIM (Omniclass; Uniclass or other) is to provide the sector with agreed and standardised terminology and semantics. It is a unique set of numbers to describe everything in the building element, and is usually agreed upon at the planning & design stages. It also aids the contractor to ensure the completeness of this information in the handover BIM as-built model. The as-built model will then be made suitable for further development into BIM FM models, to be integrated for building facilities management. New projects are always planned with different set of requirements. Either the client or the local authorities have high expectations of the overall process of implementation regarding building standards and sustainable design. BIM allows all parties including building owners, architects, consultants, contractors and FM, to work simultaneously with the access of shared collaboration and BIM information. At Level 0, there is no collaboration between parties collating information about a built asset. Most data is available in 2D (likely CAD) drawings, and any exchange in information is done so using paperwork. Most organisations today are conducting their work at this level. A Common Data Environment (CDE) is used in this case. It is an online shared repository, where all the necessary project data is collected and managed. BIM Level 1 focuses on the transition from CAD to 2D/3D pieces of information. At Level 2, collaboration is introduced between teams and the process of BIM is now being followed through. There is still a lack of a single source of data, but crucially any data collected about a built asset is now shared. There is commonality in the data structure which enables a federated BIM model to be produced. Level 3 is where full integration (iBIM) of information is achieved in a cloud-based environment. This is accomplished through the use of a common shared model. A new dimension (6D BIM), which is also known as BIM for FM is expected to evolve and develop at this stage to address the needs of FM operators. This level describes how 6D BIM Model can be well integrated with SMART Data to develop the final BIM FM Model within the Operational Digital Environment (ODE). A higher level of intelligence can be achieved through added information generated from Big Data Analytics. This environment (ODE) develops predictive and prescriptive ability – from iterative domain processes that optimises work efficiency, through continuous learning throughout the lifecycle of the building management. 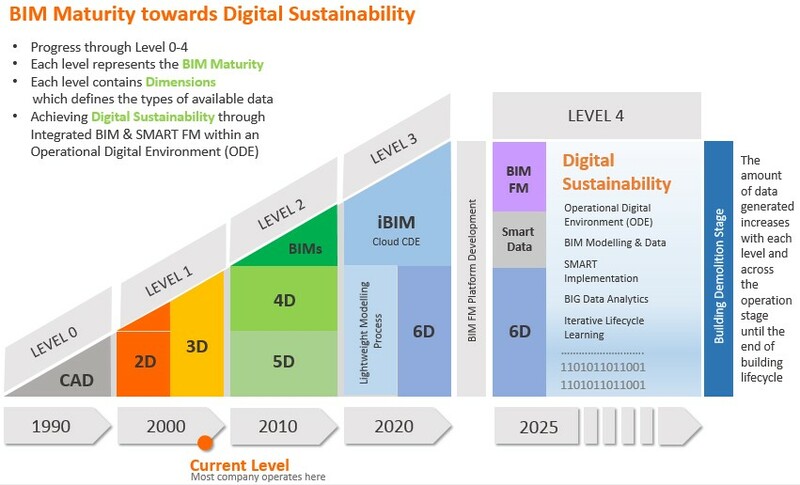 The complete process of BIM maturity progression towards digital sustainability encompasses two stages of “transformation”. First, it will undergo a model transformation at Level 3 where a “Heavy-weight” BIM (as built) Model is “transformed” into a “Light-weight” 6D BIM Model. Irrelevant information that is not required for facilities management purposes will be taken off from the completed BIM (as built) Models. Secondly, in order to be applicable for Facility Management, a final transformation process at Level 4 into an Asset Management System or “BIM FM” operational readiness is therefore necessary. This final stage of transformation shall rest on the Operational Digital Environment (ODE) for future digital sustainability. 4D – A 3D representation of an asset with the element of time is included to enable simulations. 5D – A 3D representation of an asset with the element of time and cost included/linked to enable simulations, commercial management and earned value tracking to take place. 6D – A 3D representation of an asset which includes data which enables the efficient management, operation and maintenance of the completed asset. With the ability to share information faster, easier and more accurately, it offers a significant productivity boost to the work process. The increased productivity through collaborative work can also help lower cost and increase efficiency in terms of building maintenance & management. The digital transformation through leveraging on technologies requires the FM team to re-strategise current working methods. It is not just about improving the overall service quality and realigning the scope of works, but most importantly, it’s about changing mindsets and moving out of comfort zones. It is by nature that we often depend on our experiences to conclude that we have reached work optimisation. Or are we less comfortable and more reluctant to manage changes? The process to digital sustainability requires continuous iterative learning push. Refining process and our domain knowledge as we move along with internal and external changes (including building management constraints and the advancement in technologies) is what we need to adapt. When attaining full integration of BIM modelling with higher efficiency in FM, more complex & higher quality buildings can be designed and built. This is also determined by the ability to manage more complex building with operations that require higher precision and service quality. The introduction to BIM for Facilities Management represents the highest level of BIM maturity towards Digital Sustainability of the intelligent built environment. All these new processes & technologies hold potential, but it depends on how much efficiencies and group synergies can be maximised from the various stages of integration. Can the different stakeholders across the design & construction stages contribute to a better delivery of BIM model for FM? As BIM for FM is a relatively new kid on the block, adding it to the traditional FM process means rethinking how the team works together. Nevertheless, this is still an evolving practice & change that has significant meaning & value towards building a better, efficient, smarter and sustainable environment.